This year I found Gooseberry Patch Christmas 2010. I want to make the Frosted jars!! 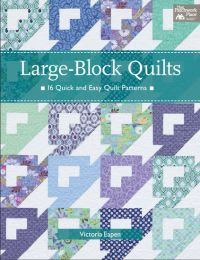 Do you have a go to Holiday book or craft book?? You could try my Chocolate Crinkles. You are so funny! Time, on our hands ... oh, I am so going to have to do a blog post picture with that humorous picture :) Thank you for sharing, Vickie! Love your magazine!! Thanks for the recipe! Sounds yummy!Will see if I find some time somewhere...lol! Great magazine. I do sometimes buy christmascrafts magazines with ideas to make together with our kids. 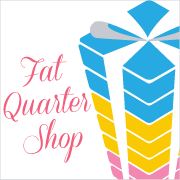 My go-to is a lrage tin box stuffed with all the favorite and old family recipes. Time to put them in a book! Thanks for the recipes! I'm looking for that magazine! Thanks for the recipe! Oh! I love Gooseberry Patch! They are one of my favorites! Thanks for sharing! Children to roll the little balls are a necessary ingredient in these cookies! I love all the Goose Berry Patch cookbooks, and especailly the special magazine issues that they come out with during the holiday. Thanks for sharing your cookie recipe. That is a good book! We keep Ina's cookbook out, every year we have a cooking contest and the kids have be come quite the cooks because of it! 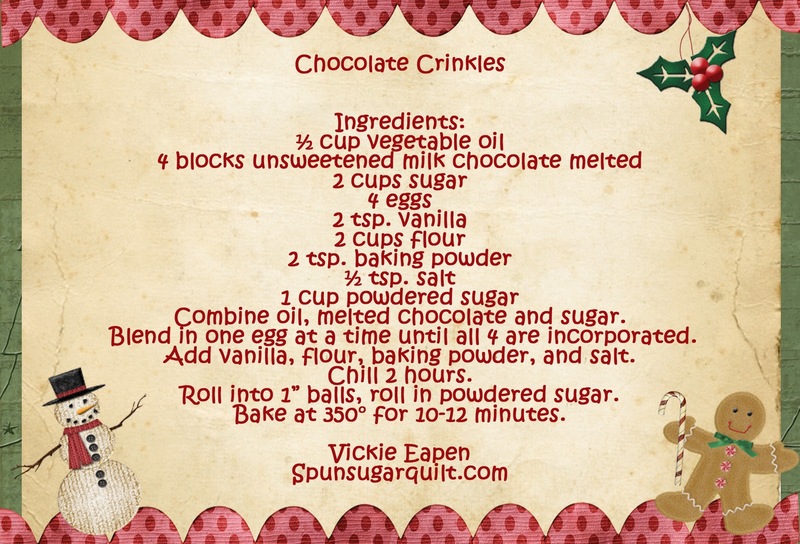 Crinkles, you just want to make them because the name is fun to say! I love Gooseberry Patch. I have their books back to the year 2002 thanks to my mom! Recipe looks yummy! Thanks for sharing. I'm curious about the Frosted Jars. mmm my fav cookbook still remains my Nanny's, she gave us all a copy before she passed...it is called SWEET things..and that she was...crinkles. I do love and it was certainly one of my Nan's fav..sew in her memory I am baking some today..ty. 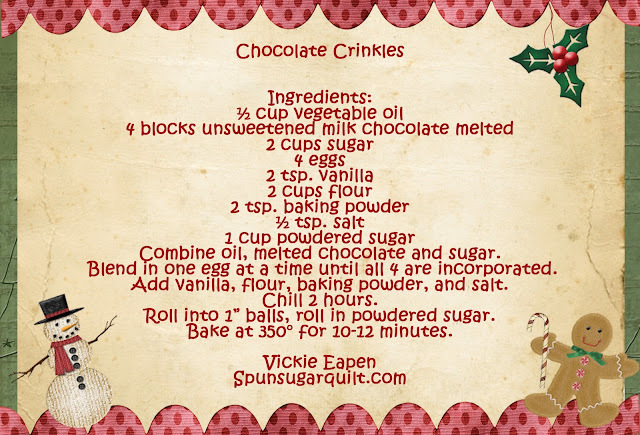 The Chocolate Crinkles sound delicious and every holiday craft book. The Christmas Story is the one we read for the grand kids on Christmas Eve. We make these cookies every year...my sister's are the best! Thanks for sharing your recipes. And yet another new-to-me cookie. Great! I was hoping that was the Gooseberry Patch edition I have but, alas, min is the 10th addniversay edition. Now I'll have to go sob for awhile LOL Just kidding! These would be so good with a cold glass of milk. Can't wait to make them. Thanks for another positively yummy sounding recipe...I have seen these cookies around, but have never made any...That's about to change! I have all the Gooseberry Patch Christmas books, too! Wouldn't be Christmas with out them!! Thank you for your recipe! Can't wait to try them!! This looks like a great recipe to try-thanks. LOVE Gooseberry books - I even OWN a couple of them, didn't know about the Christmas one. Oh, no...thanks for the recipe! Don't know that magazine, in France there are other's. ELLE NOËL. Thanks for the recipe. I have to go find the Gooseberry Patch Christmas book now. It looks great. Thanks for the recipe. My daughter loves the gooseberry patch recipe books, and thats what she requested for Christmas. Now I will have to find her one as well as one for myself. Thanks for the great recipe. Like you I am short on time. Would like to do a lot more than I do but then go back to the reality of I can only do what I can do without driving myself crazy. I keep saying that I need to try these books! Maybe this will be the year! I LOVE Gooseberry Patch books - I must look for this new one. Thanks for sharing your recipe! Gooseberry Patch! I love their ideas :) Isn't it wonderful how many creative people there are in this world! I'll have to check out the book! Thanks for another great recipe! 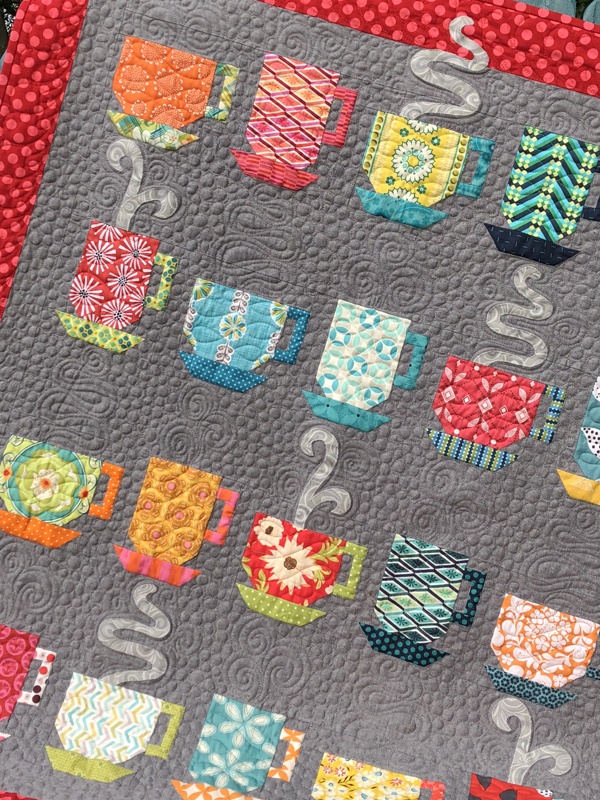 Like the mix of quilting, crafts and cooking in the Gooseberry books! I've been collecting the Gooseberry Patch books since they first started coming out. Thank you for the recipe. Gooseberry Patch books are great! Thanks for the recipe! If it tastes good, it's worth the effort. And I'm sure these cookies taste great. I've been on the look-out for Gooseberry Patch 2010, but haven't had any luck yet. Chocolate is our favorite food group up here in Alaska! Thanks! I don't have a Christmas book, but have you seen One Yard Wonders? So many ideas! Chocolate crinkles - I love chocolate in cookies. Thanks for the recipe. No, I don't have nearly enough time on my hands! My job interferes with my hobbies. I am going to try to find this book! I love Gooseberry Patch too! Lots of fun things in those books. My mom used to make these every Christmas. The memories start flooding my mind. Thanks.